This charming Christmas poem may have been the longest poem that we memorized as children. The rhythm is as enchanting as the lore behind the story. It is embedded in Christmas Eve tradition around the world. 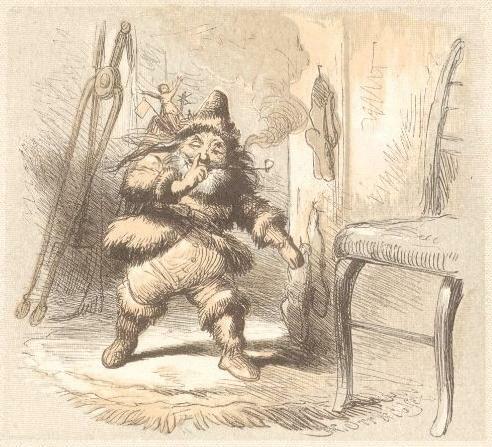 “A Visit from St. Nicholas” was written in rhyming anapests, the meter suited for the whimsy of the magical visit. The vivid descriptions became the foundation for the modern day interpretations of Santa Claus. “A Visit From Saint Nicholas,” later known as “’Twas the Night Before Christmas,” originally appeared anonymously on Dec. 23, 1823 by Mr. Orville Holley, publisher of the Troy Sentinel newspaper in upstate New York. Other publications picked up the poem and reprinted it into Christmas tradition. Clement Clarke Moore claimed authorship of the Christmas classic thirteen years after the poem was first published. One account has it that he composed the poem in his mind while shopping, recited it to dinner guests, one of which wrote the poem down after the dinner and presented his transcription to Mr. Holley for publication. Another account claims that Mr. Moore’s housekeeper submitted the poem without his knowledge. Either way, his claim of authorship was accepted and he included the poem in an anthology of his work in 1844. Mystery solved, or was it? The children of Henry Livingston, Jr. came forward and claimed that their father wrote this poem and had been reciting it to them for many years, as long as fifteen years before it was published. Their childhood friends remembered his recitals and collaborated the family’s story. They cited that they once owned the original copy of the poem, to include revisions, but lost it in a house fire. Clement Clarke Moore was born in New York City, the only child of Reverend Benjamin Moore and Charity Clarke Moore. He attended Columbia College and graduated at the top of his class. Moore, a very religious man, was professor at the General Theological Seminary in Chelsea Square from 1823 – 1850. He married Catharine Elizabeth Taylor in 1813 and together, they had nine children. Henry Livingston Jr. was born in Poughkeepsie, New York in 1748. He was a farmer, surveyor, Justice of the Peace and Major in the Revolutionary Army. His daughter, Catherine, inspired his first known poem. Livingston wrote many poems following the death of his wife. Although he was a published poet, most of his poems were published anonymously or under the simple pseudonym R.
This Christmas Mystery is a cold case. Scholars and literary investigators have compared the poem to the writing styles of both authors and in most cases, conclude that circumstantial evidence would place author credit to Livingston. His demonstrated poetic voice and Dutch ancestry pair well with the anapestic meter of the poem, the names of the reindeer and vivid descriptions in the poem. That said, there is no evidence to tarnish the good name of Moore, the man who first came forward to claim author credit. Why would a devout man claim poetry that was not his? With all of the magic around the season, is it possible that in the middle of the night while children and mice were sleeping, a little elf whispered the same poem in the ears of two poets in hopes that one would share with the believers of the world. Maybe the true author is a rotund northern toymaker with a great fondness for cookies and milk. Thank you for joining me for Pretzels & Bullfights and this look at a Christmas favorite. In the words of my favorite elf, Happy Christmas to all and to all, a good night. Really? I had no idea the origin of this poem was so controversial! Sorry, clicked post too soon. I mean to thank you for doing the research and for enlightening us! I learn something from you every time. Thanks so much. Recently, a mock trial was held in which both sides were presented. The jury cane back woth a unanimous decision that Livingston was the author. A very curious case of who-dun-it. Thanks so much and happy holidays. Thank you, Claudia. I hope your holiday showers you with forever smiles. Thank you for the story, Beth — great background info. I am going to go with Livingston — the evidence points that way. Really, we have volumes and volumes of stories of devout men doing horrible things. Being religious protects no one from their foibles. Being devout is indeed often the mask people use to hide their misdeeds and manipulative personalities. Being devout means nothing in my book — absolutely nothing. In fact, it makes me suspect. I like to think the best of people too, and usually do. But over the years, I’ve seen the patterns of people who hide under sanctimony — political, religion or otherwise. Thank you, Beth for your erudite and entertaining exposition …. Intriguing back-story to this, Beth. Whatever the truth, the meter does make the poem all the more memorable and it has been a part of my life for as long as I can remember. Thanks for researching this…something I never would have thought of. Fascinating to learn of this controversy, I never knew! I have been reciting since I was a child, probably the longest bit of writing I actually know by heart! Thanks for sharing this, Beth. Truly appreciate the research and writing that you did to bring this to light! Interesting background here, Beth! After losing our first grandchild (miscarriage), I purchased an Usborne book of “Twas the Night Before Christmas” and recorded myself reading this classic poem…a memorial gift for all my grandchildren to enjoy. Super job with the research, B. But somehow I thought this would be the beginning of the dVerse Holiday hiatus–guess not. Does that mean we will have prompts 4 poetics tomorrow, & MTB on 12/18, or what? Yes, the hiatus starts after this week. Thanks so much and happy holidays! And, an OPEN LiNK is scheduled for this Saturday as well, Glenn! I look forward to another Buck episode. Smiles. Merry Christmas everyone. We have had a few time-consuming challenges in our lead-up – nothing major, just very time-consuming, hence not much in the way of poetry for me until 2015. Happy New Year to everyone as well.